Patch 2.7: The Frozen Frontier is coming! The Scoop of Justice, is a brave Gelati knight. The Gelati are brilliant craftsmen famous for their delicious Ice Cream Castle. The gelatinous knights gather snow and ice from different planets and mix them with sweet candies and fruits. Although cocoa trees haven’t been seen for ages and are thought to be extinct, the Gelati see it as their sacred duty to find a real piece of chocolate and create the ultimate flavour of ice cream: stracciatella. 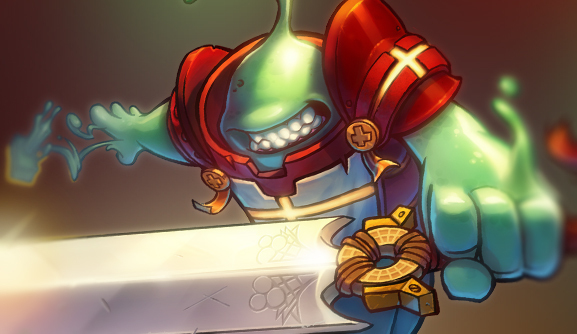 Scoop was assigned by the lords of his house to aid the Awesomenauts in protecting the universe from the new Omicron threat. Scoop will be available to all Awesomenauts players when Patch 2.7: The Frozen Frontier hits. Note that this character won’t be Starstorm exclusive. So even if you do not own the Starstorm expansion, you will be able to show that the might of the icecream knight is always right!